We already know that the iPhone 8 will almost certainly have an edge-to-edge OLED display, support wireless charging and feature a dual-lens camera, however, now it seems like we can tick the "Touch ID" box as well, with the sensor seemingly set to be located on the back of the smartphone. "Both Samsung and Apple tried to enable in-display fingerprint sensing on full-screen OLED phones in 2017, but their optical tech seems immature and the major iPhone 8 bottleneck. Some thus speculate the fingerprint sensor will be removed and replaced by 3D sensing. 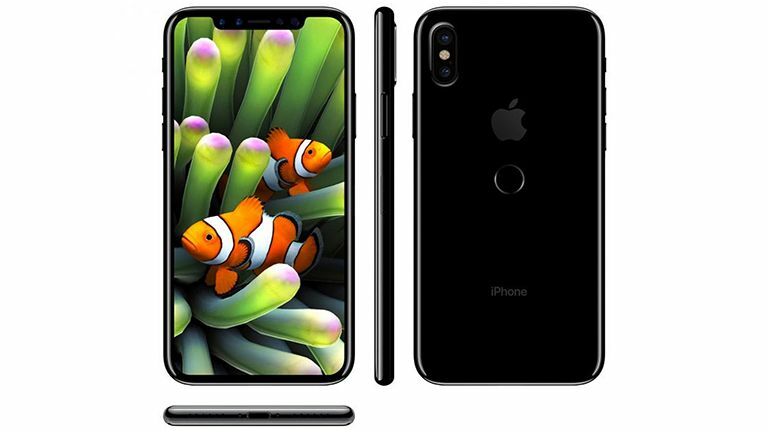 Our latest supply chain checks indicate the iPhone 8 will still have the sensor given security, user-friendliness, and a need for payments infrastructure, but there is a high chance it will be on the back like Samsung's Galaxy S8." Along with the research note, CLSA also distributed an in-house diagram showing the Touch ID sensor placed slightly below the Apple logo on the rear of the device, a move that would see the sensor a lot easier to reach than Samsung's sensor on the Galaxy S8, which was placed next to the phone's camera. A rear placement of the Touch ID sensor makes sense to us at T3 Towers, however, we're not sure if the central placement will come to pass as it is awfully close to Apple's beloved logo. But what do you think? Should Apple place the Touch ID on the back of the iPhone 8? And furthermore, should it be high or low?